You are cordially invited to attend the celebratory opening and dedication of the Campus’ latest creek restoration project. The event is Wednesday April 8th from 11 am to 12 noon near the west side of the Eucalyptus Grove on the Central Campus. The celebration will begin with opening remarks by Office of EH&S/OEM Executive Director, Mark Freiberg. Project managers and designers will give a brief overview of the restoration project. The ceremony will conclude with a dedication of the project to the memory of Steve Maranzana, former EH&S Manager and Cal alumnae. Please feel free to distribute and post the attached event flyer. 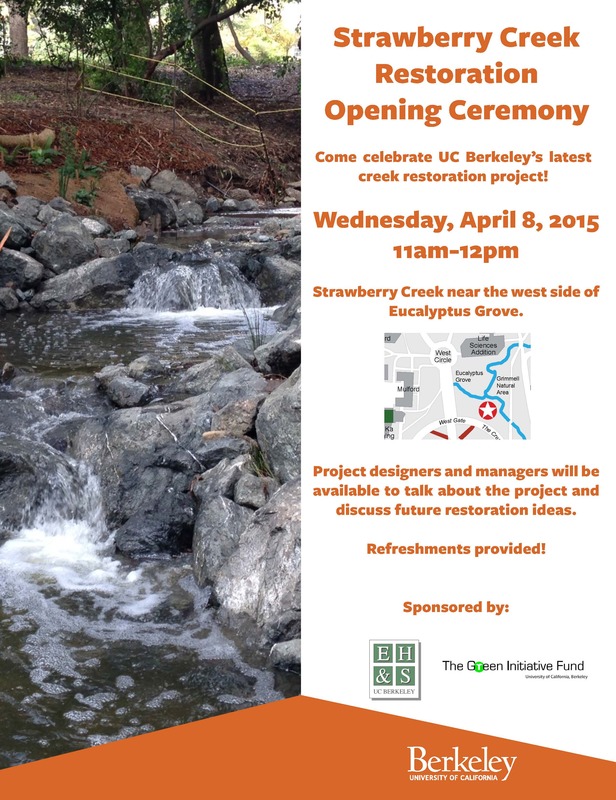 The event is open to all members of the campus and creek restoration communities. We are a student research and design group working in collaboration with campus staff, faculty and ESA PWA to design and implement solutions to improve riparian habitat and ecological function at the confluence the north and south forks of Strawberry Creek on the UC Berkeley Campus.